We were very lucky to have a guest speaker at last week's RISE Team meeting. 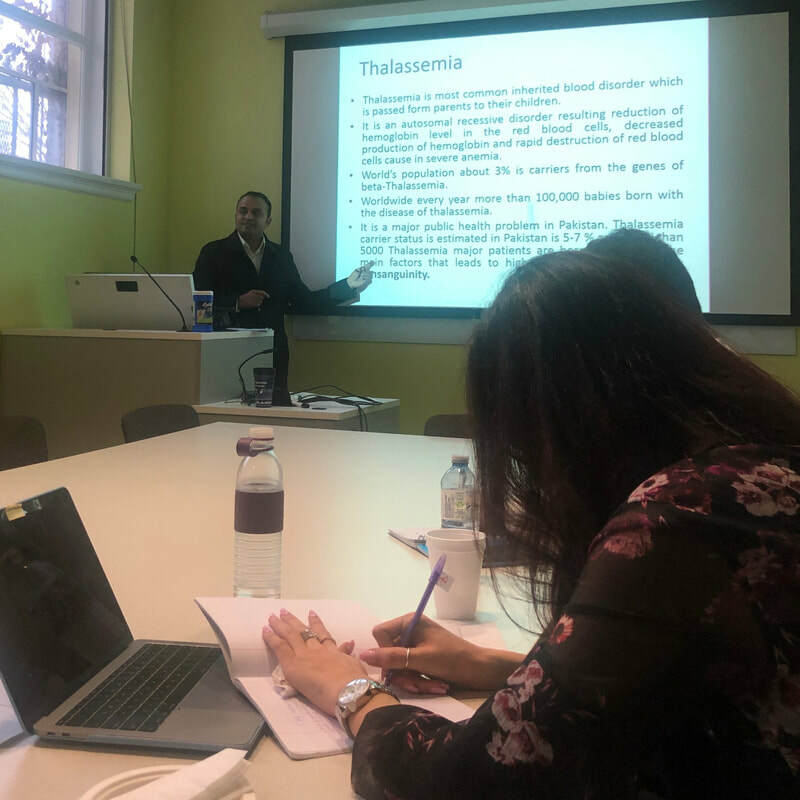 Dr. Kamran Ishfaq (Assistant Professor of Sociology, Bahauddin Zakariya University Multan, Pakistan and current Postdoctoral Fellow at UofT Sociology) gave a fascinating and inspiring presentation on barriers to the screening and diagnosis of thalassemia, an inherited blood disorder, in Pakistan. "Prevention is better than a cure" is the guiding principle behind Dr. Ishfaq's work to develop an accessible and low-barrier educational program for thalassemia screening and diagnosis. His careful analysis takes into account gender, culture, financial strain, and other important sociological factors. A puzzle that motivates his work is how to adapt strategies that have led to prevention and elimination of thalassemia in Muslim-majority countries like Iran and national contexts like Canada for use in Pakistan. His fieldwork currently involves a large-scale study inside a public hospital which will hopefully expand into programming and screenings in schools, Universities, and other national institutions. Dr. Ishfaq's research is high-impact and makes a direct contribution to people's health and well-being. We wish him all the best in the next phase of his research this summer in Multan, and look forward to more conversations with him in Toronto and beyond! Laila Omar at Oxfam UofT's "What She Knows Matters"
Neda here! Laila Omar (@LailaMOmar) made our team very proud in a solo presentation at last Friday's "What She Knows Matters" event sponsored by Oxfam UofT. Laila was one of three invited speakers at the Centre for Social Innovation and in her remarks, she shared narratives from #RISETeam research participants about their pre-Canada experiences in refugee camps in Turkey, Lebanon, and Jordan. Although I couldn't attend, a steady stream of texts and emails from people in the audience kept me up to date on (1) how EXCELLENT Laila's talk was and (2) the delicious catered dinner. See slideshow below! Sincere thanks to Naomi, Sunah, and everyone at Oxfam UofT for hosting this important conversation and fundraiser. UofT News Visits Our Weekly Team Meeting! Just over three years ago, the first wave of Syrians began arriving in Canada, fleeing the civil war that uprooted their lives and drove them to refugee camps across the Middle East and Europe.Today, those families are continuing to adjust to life in Canada – navigating their way through learning a new language, the education system and our frigid winters. Throughout the resettlement process, a group of University of Toronto researchers have been capturing an intimate portrait of what life has been like for Syrian newcomer families. 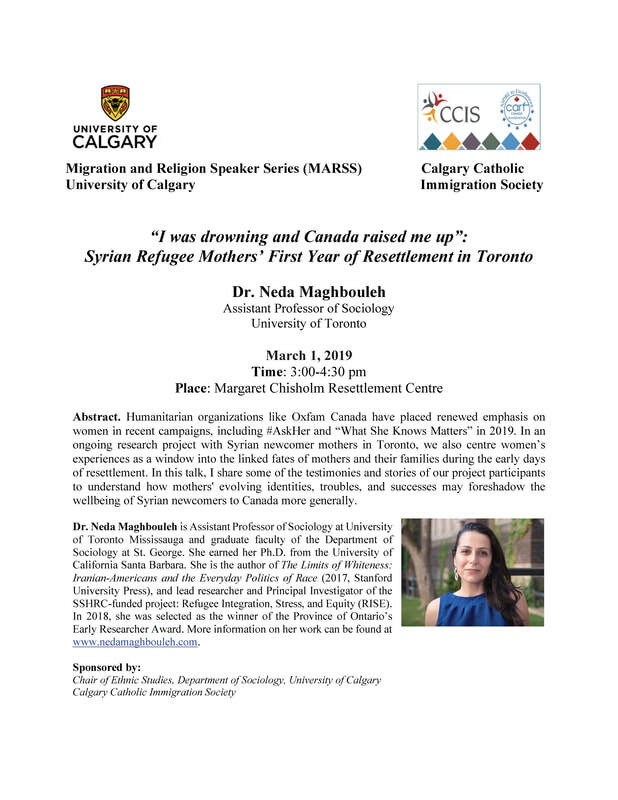 The research group – led by Neda Maghbouleh, an assistant professor of sociology at U of T Mississauga, along with Professors Melissa Milkie and Ito Peng – is exploring how the nature of Syrian newcomers’ successes and challenges change the longer they are in Canada. The all-women investigator team was intentional, says Maghbouleh. Women, too, are the focus of their research. And that’s exactly what they did, interviewing 41 Syrian mothers twice within their first year in Canada. The research initiative began as a much smaller project, funded by the Social Sciences and Humanities Research Council (SSHRC) and the federal department of immigration, refugees and citizenship. “Out of that project, we learned that one of the most significant stressors for mothers that seemed to really affect outcomes for families was how teenage children were faring,” says Maghbouleh. Last year, Maghbouleh was the recipient of an Ontario Early Researcher Award, providing the initiative with a funding boost that allowed them to grow the research team. At the same time, they received a SSHRC Insight Grant to take the project even further. The on-the-ground researchers all speak Arabic, so they are able to connect with Syrian families on a more personal level. “I have assembled through sheer luck and the beauty of being in Toronto this multigenerational team of researchers here with U of T affiliations everywhere from early undergrads through people with PhDs who themselves are newcomers from the Middle East and the North Africa region,” says Maghbouleh. "Most of us are immigrants and we've been through similar situations. 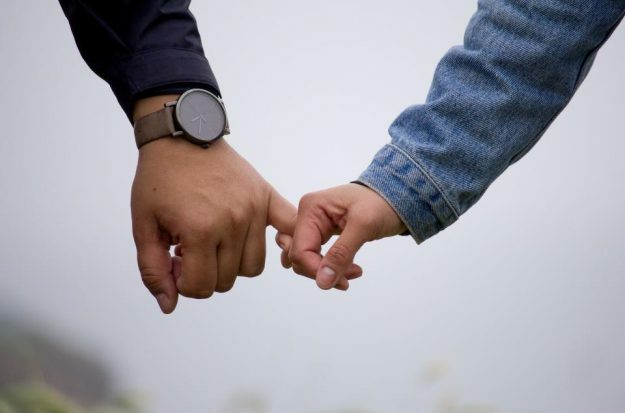 It's easy for us to build rapport with them," says Laila Omar, a research assistant and PhD student in sociology, on relating to the women and teens interviewed. Researchers are in the process of collecting data through interviews with mothers and teens – where they are often welcomed into family homes to talk over tea or during dinner. “All of the people on our team have the insider or cultural knowledge it would take for families to so generously open up their doors, which is what they do,” says Maghbouleh. Not only is the nature of the research multigenerational, but the research team is too. Postdoctoral researcher Rula Kahil is working alongside her son Nour Habli, who is in fourth year studying international relations and architectural theory. During a recent outing to interview a mother and teen, Kahil and Habli were initially hesitant to disclose their familial relationship. But once they did, they realized it was a huge help, not a hindrance. “That somehow created ease within our interaction,” said Kahil. During the current wave of interviews, researchers say they've noticed a significant change in the way Syrian mothers talk about their lives in Canada. Learning English has also helped them gain confidence, she says. The mothers interviewed say their biggest challenge is financial stability. Government-sponsored and most privately sponsored refugees were only financially supported for one year, so they are now trying to find ways to sustain themselves and their families. When interviewing teens, their stories reflect how much they’ve endured in such a short amount of time, says Anmul Shafiq, a research assistant and recent graduate of political science and criminology at U of T Mississauga. Shafiq says one interviewee moved to Turkey from Syria, where her mother was diagnosed with cancer and her father was ill. Expanding the research project also meant involving Syrian newcomers in the research process, says Maghbouleh. Iman Abdul Razzak moved to Canada after graduating from Monmouth College in the U.S. Originally from Aleppo in Syria, Abdul Razzak left the war-torn country for Turkey around five years ago, and soon after, moved to North America for school. While her brother is in Canada, the rest of her family lives in Sweden. “It was very difficult to adjust,” she says of moving to the U.S. at 18 years old. But in Canada, Abdul Razzak has found community amongst her fellow Syrian newcomers, making friends and participating in local initiatives like CultureLink’s Syrian children and teen choirs. She’s considering applying for graduate school in 2020, but is enjoying being a part of the U of T research team in the meantime, where she helps to recruit families to be interviewed. Maghbouleh’s research group is gearing up to release its first paper on the first round of research in Meridians, an interdisciplinary feminist journal produced by Duke University Press, and a book chapter in an edited volume about Syrian refugees in Canada written by teams across the country and published by McGill-Queen's University Press. RISE Team Goes to Calgary Catholic Immigration Society! RISE Team recently had the honour of visiting an organizational leader in the field of Canadian resettlement services since its founding in 1981, Calgary Catholic Immigration Society (CCIS). From former clients-turned-staff members to the CEO of the organization, nearly 50 CCIS leaders took time out of their busy schedules to give Neda and RISE Team crucial, expert feedback on early findings. Our Friday afternoon talk was scheduled in the sunny and welcoming kitchen of CCIS' Margaret Chisholm Resettlement Centre (MCRC), with enough strong black tea, cake, and fresh fruit to keep everyone nourished through the conversation. 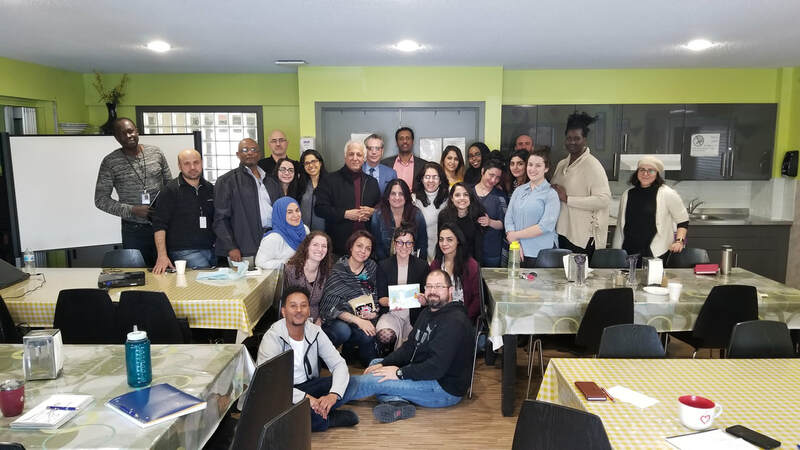 CCIS staff offered feedback about our research with Syrian newcomers in Toronto, including ideas for more probes around issues like familial and intergenerational conflict, suburban/urban resettlement, and entrepreneurship. In turn, we came away with incredible testimony and evidence of CCIS' work in Alberta to share back with RISE Team in Toronto. The staff of CCIS are experts who have directly resettled 4,000+ newcomers in Calgary. The organization has touched the lives of tens of thousands of others through wraparound services including community development and rural services and family and children's services. CCIS have been early leaders in the resettlement of Eritrean, Ethiopian, Nigerian, Syrian, Yazidi, and many many other newcomer groups-- in fact there are 94 different languages spoken among CCIS' clients! The MCRC, where our talk was held, is considered by newly-arrived refugees to be their 'first home in Canada' and provides supports including three meals a day, apartment-like accommodations, recreation and play for children, and basic needs services like laundry for clients for the first 14 days after landing. For more on MCRC and CCSI, see https://www.ccisab.ca/refugees/mcrc.html. We are inspired and excited about CCIS' research partnerships with sociologists like UCalgary's Dr. Pallavi Banerjee and we can't wait to hear more about our new friends and colleagues in beautiful Alberta. We sincerely thank CCIS (especially CEO Fariborz Birjandian and Manager of Resettlement and Integration Bindu Narula) and MARSS at University of Calgary for an unforgettable visit!